As the modern age continues to advance, our work culture has changed with it: the hiring process starts online, instant communication blends the line between business and personal, and office designs have been completely revamped. We’ve moved away from the traditional, bare cubicle design into a transformative space that fits the modern workforce. Now more than ever, employees will choose jobs based on the amenities and design of the place they work. You’ve probably heard a lot about open space layouts, but that’s only the surface of how the office has evolved into its current style. Extending from the open space concept, the modern trend utilizes all of the office into a productive and flexible work area. Kitchens become communal canteens with lots of seating for collaborative lunch times or those who need more white noise as they work. It usually includes some free amenities like coffee, tea, and snacks. On the opposite spectrum, a relaxing space to recharge has also become popular in an effort to prevent burn-outs so employees can sustain their productivity. Some businesses go all out on their relaxing spaces, but sometimes all you need is a comfortable couch and some low lighting. 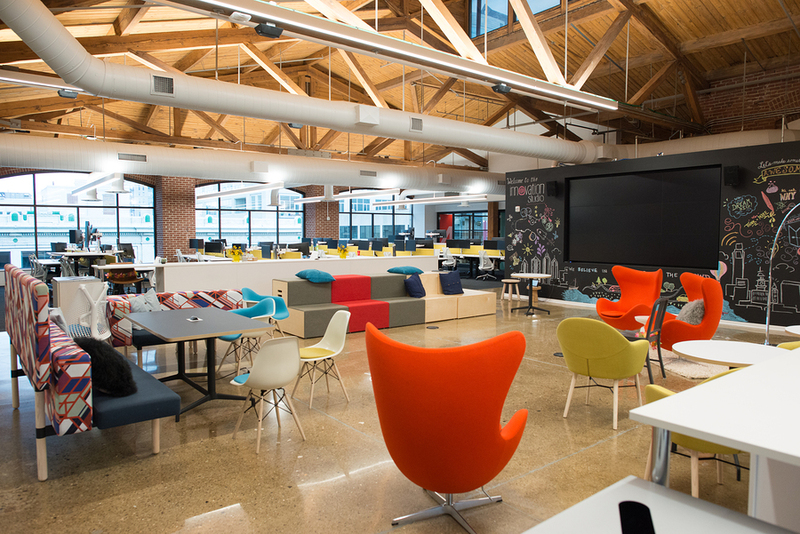 A recent addition to the open layout includes open meeting areas often called collaboration zones. Along with closed rooms for important meetings, offices will have spaces tucked away or set to the side of the main area. These “rooms” are separated by panels or low walls and can simply hold a table with two chairs for a couple people or be larger with a whiteboard for creative collaboration. A mix of both sizes will benefit employees who want to change up their scenery or open up a discussion to the room (and anyone walking by). It creates a culture of moving collaboration, which can improve productivity. Supporting that model, the modern desk breaks away from closing employees in a box to shared desk space. Instead of setting up cubicles, businesses set up a circular or rectangular table separated into individual work areas referred to as pods. It still gives the employees some structure while the office design encourages moving around for a more innovative approach to the work day. Overall, the attractive workplace will implement a more “homey” feel to their office so that employees will feel comfortable for a more effective work day. Whether your office needs a few new items or a whole new set of furniture, Great River offers a full catalog of products to help start your project. If the task simply seems too daunting, then we recommend contacting our team of interior designs to get the most out of your space so you can attract new employees while supporting your current team.